With our growing financial needs, not to mention the continuing price inflations among basic commodities, it is only but wise to find other ways to earn an income aside from your salary. Did you know that more homeowners are now enjoying the benefits of earning an effortless income out of renting their basement space? The good news is, it is not yet late for you to try the same too. You can turn your basement into an amazing rental unit rather than the space staying idle and basically useless. All you need is to provide a separate entrance and exit. Think about the leaks and the amount of air seepage it allows that require more energy to maintain the desired temperature inside your home. Dark and cluttered basements are favorite home to molds and mildews. Attracting prospective buyers is much easier when you have an adequately finished and functional basement space. To utilize the space that you already have. Rather than serving as your storage room, you can use the space in your basement into more useful areas. You can turn it into a playroom, an exercise room, an entertainment room or your home office. Moose Basement is your affordable one-stop construction shop here in Milton. Our quality of service is one of the most competitive here in the area. We use innovative products to ensure durability and construction reliability. Our products are eco-friendly and as per customer request, we can add more green whenever the customer wishes to enhance their space’s positive environment vibes. We have fifteen years of unparalleled basement construction and remodeling services. Our customers provide us top reviews following years of successfully completed projects. We offer custom design service to suit your needs. Our team will work closely with you starting from the planning, designing, construction and final trimming. Do not miss our upgraded basement renovation services. Dial our number now at 647-232-5353. We are encouraging you to take advantage of our free initial consultation services. 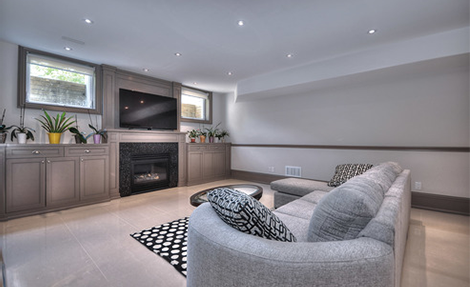 We provide the best basement construction, renovation and finishing solutions in Milton and other areas in Canada. So, why search any further. Contact us now and make your dream basement space become a reality.